(CNS): The Cayman Islands will have the most expensive cruise passenger fees in the region if government goes ahead and signs a deal with China Harbour Engineering Company. According to a report commissioned by the Port Authority Board and conducted by KPMG in April last year, shortly after the premier terminated the talks with GLF Construction, the Chinese developers plan to charge the cruise lines US$35 per passenger, compared to a maximum of US$18.85 proposed by GLF. The report warns that the fee could be too high, and with no passenger guarantee underthe Chinese deal, the consultants warn of the real risk that Cayman could price itself out of the market. The report (attached below) also reveals that if the cruise lines swallowed the $35, the profit to the Chinese over the fifty years that they would operate the cruise port could be quite significant. Furthermore, government would be giving up potential revenue with the Chinese deal for far longer than the time proposed by GLF, which would have seen the developer collecting on cruise fees for 25 years, not 51 as now proposed by CHEC. KPMG was asked to make a comparison between the two proposal, which it said was difficult because at the time the consultants had few details on the CHEC proposal, referred to in the report as ‘Developer B’. Noting significant differences between the two proposals, which made a true comparison difficult to make, the consultants did find that there were risks with developer B’s proposal. They pointed in particular to the requirement to relinquish the management of the port to the developer, relegating the Port Authority of the Cayman Islands (PACI) to a regulator from its current role as manager. "Passing control of the port to a third party would require detailed concession agreements and contractual arrangements to ensure operations and management are in line with required standards – this creates contractual risk and increases the complexity of the project,” the firm stated. It further noted that in 2008 PACI had made a decision that it should retain control of the port management as this was considered the most appropriate operating model. 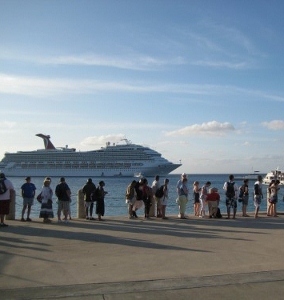 Speaking about the fee increase and the failure of developer B to secure passenger guarantees from the cruise lines, KPMG said there was a potential risk that cruise lines will reduce the port of calls to Grand Cayman, or even avoid the destination altogether, in response to such a significant increase of some 100%. However, the profit that could be made if the cruise lines accepted the fee would be significant and KPMG pointed to the need for the government to reduce the time period that CHEC would be managing the port in order to ensure the public purse benefited sooner from the profit. On seeing KPMG’s report, the independent MLA for North Side, Ezzard Miller, said it was "alarming" to discover the Chinese would be doubling the fee proposed by GLF. He also noted that the Chinese could make a pure profit of over a billion dollars on this project. Compared to the proposal submitted by GLF, CHEC would be getting “three bites of the cherry”, he said: not only would they make the money on the financing agreement, they would also profit from the construction element and from what is now believed to be a 51-year lease on the port. The independent member said the report made it clear that the GLF proposal was a far better deal for the Cayman people because they would cease collecting the passenger fee after 25 years, 30 at most, and there would be no upland retail to compete with local merchants. He said that the project never required any government guarantees, contrary to claims made by the premier, as the only thing GLF needed to start work and get access to financing was the signed master agreement for the project. The increase in fees would, if the cruise ships continued to come, produce a substantial return for the Chinese, which would be added to the profits the firm would make from the upland development, Miller stated. The higher fees are down to the massive difference in cost as the CHEC plan for the two piers and upland element is expected to cost around $350 million, compared to the GLF proposal at around $175 million. The Beijing-based firm has also agreed to upgrade Spotts jetty and build a pier at the Turtle Farm in West Bay and will expect to recover costs for those two projects via the George Town facility. (CNS): The governor has admitted that there is room for improvement in the civil service and that changes are imminent. Duncan Taylor said Thursday that he intends to do everything he can to make the necessary improvements and that he has some experience of dealing with public sector change management after the overhaul of the UK’s Foreign Office, of which he was a part. Acknowledging the problems of bureaucracy, the governor said he had seen no evidence of deliberate stonewalling in the public sector, despite complaints. When Franz Manderson takes up Cayman’s top job in the public sector on 1 February, he would be driving forward some of the imminent change management issues, the governor said. Speaking at last week’s Fidelity CBO conference during the panel discussion on good governance, the governor said the new deputy governor would be overseeing the culture of change that was beginning to emerge in Cayman’s civil service. There will also be some personnel changes coming to the senior management team as Manderson’s own post needs to be filled as well as other top ministry vacancies due to the retirement of Carson Ebanks and Kearney Gomez. The governor said that change management was not always easy and sometimes it was uncomfortable but he said it would be driven forward. He spoke about the need for legislative changes to the Public Management and Finance Law to make it fit for purpose and the possible need to change the Public Service Management Law as well. Taylor said he recognised some problems with efficiencies that were raised by the audience but he said there was a big difference between the length of time it took to get a licence, for example, because of the process and people who were actively trying to stop or slow down the implementation of government decisions. “I have heard suggestions that this does happen and I have made it clear to colleagues in government that if they will provide me with some evidence of what is going on I will look into it,” he said, adding that so far no one had produced any evidence to support the accusations. The governor said that did not mean it wasn’t happening but without the evidence or specific examples there was nothing he could do. On Friday officials confirmed that Donovan Ebanks would officially retire as deputy governor and pass the mantle on to Manderson. Taylor thanked Ebanks for all his hard work, dedication and commitment shown over his long and career as well as the support and advice he had given him since he became governor two years ago. “I wish him all the very best on his retirement. I also would like to wish Franz every success in leading the civil service in these challenging times. I look forward to working with him,” he added. (CNS): Cayman Heart Fund (CHF) is hoping to make this year’s annual fundraiser a real heart stopper as it collects money to save hearts in the future. Ron Adams, famed Elvis impersonator will be the headline act at the annual Red Dress Gala on Feb. 10 at the Marriott. The best dressed couple will win 3 nights in Miami courtesy of the Cayman Airways and the Marriott. In addition, there will be silent auction items to bid on, an exquisite dinner by Chef Le Pape, great music, prizes and dancing all night long. The Cayman Heart Fund is a non-profit, non-governmental, charitable organization which was established to strengthen Cayman’s health. Its aim is to alert, reduce and help prevent Cardiovascular Disease – Cayman’s #1 killer. This is achieved through education, services to the public like FREE medical screenings and by providing medical equipment and training. For tickets please contact caymanheartfund@gmail.com or 345-916-6324. (CNS): The invasive lionfish will be on the chopping block at this year’s Taste of Cayman food festival on Saturday as chefs demonstrate how to clean, prepare and cook this ocean pest which is threatening Cayman’s reefs. Local firm Home Gas will be sponsoring Lionfish Cooking Demonstrations at the Bon Vivant Kitchen during the festival where four local chefs will show safe handling procedures and how to prepare delicious dishes with the tasty but unwelcome fish. As the biggest threat to our beautiful reefs, organisers said it is important that the public learn how they can help keep the lionfish at bay, not just through culling efforts but by eating them as well. The Home Gas Lionfish Cooking Demonstrations will run from 5:30-8:00pm with the help of emcee Derek Bollingbroke, the demonstrations will be not just educational, but also an entertaining featured area at the festival. Recipes featured at the Bon Vivant kitchen by the chefs at the festival will be available to the public at www.tasteofcayman.org and samples of the lionfish can be tasted at the Home Gas booth. For more information about the festival, visit www.tasteofcayman.org. 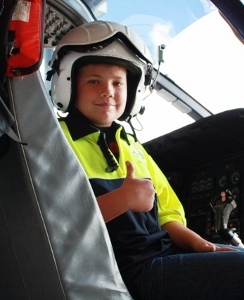 (CNS): An 11-year-old boy who donated his birthday cash to a diving charity was given a tour of the RCIPS helicopter recently to mark his special birthday. Trey Milgate, who had his 11th birthday on the 11th day of the 11th month in 2011 decided to mark the occasion by throwing a birthday party for around 80 of his friends and classmates who were asked not to buy him presents but instead give donations for the ‘Stay Focused‘ diving charity for teens and young adults. Trey, who is a keen diver collected $1350 for his charity. The police commissioner, who was present when Trey delivered the cheque to ‘Stay focused was so impressed he invited him to visit the Air Operations Unit. On arrival last Wednesday (rey was presented with his own Air Operations shirt before being briefed by the crew. He then hopped into the pilot’s seat and took control but only on the ground. (CNS): The UK has agreed to re-open the dialogue with Caribbean countries on issues relating to the Air Passenger Duty (APD) which is threatening the region’s tourism sector. The UK agreed “in the spirit of cooperation and in the context of the importance of tourism to the economic development of the Caribbean,” at this weekend’s forum to continue dialogue with a view to assisting the region in mitigating any deleterious effects the tax may have on its economies. At the end of the seventh UK-Caribbean Forum in Grenada the Caribbean and the United Kingdom have also agreed on a new strategic partnership to promote prosperity growth and development within both regions. The partnership is reflected in a 31-point action plan (below) which was issued at the end of the two-day political dialogue on Sunday afternoon. The action plan outlines four major areas of cooperation: economic resilience, security, climate change and sustainable development and foreign policy. According to a release from the FCO the Foreign Ministers agreed to build economic resilience through development of practical mechanisms that will boost growth in investment, employment, production and trade opportunities that would benefit both regions. The UK agreed to support the efforts of the Caribbean in improving their food security through efficient production and distribution measures. The Foreign Ministers also agreed to develop effective coordination mechanisms to help advance the fight against drugs and international crime as well as tackling pressing socio-political and security issues which threaten international peace and security. In the area of climate change and sustainable development the UK noted that the Caribbean already had a very strong voice in the international community and is poised to “give value for money.” Foreign Ministers agreed on the urgency of closing mitigation gaps to bring global temperatures well below 2oC. 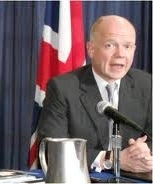 “We want to strengthen and deepen our cooperation on these and other issues,” Hague added. Around one and a half million British tourists visited the Caribbean in 2010, and tourism is a key plank of the economy. The UK is a major investor in the Caribbean and recent large investments have included those of BG in Trinidad & Tobago, and Pinewood Studios in the Dominican Republic. 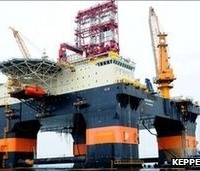 (BBC): A large oil rig has arrived off the coast of Cuba to begin searching for offshore oil deposits. Several international companies will use the rig to drill exploratory wells in deep water in the Florida Strait, which separates Cuba from the US. Cuba is hoping to confirm estimates that it has billions of barrels of oil in offshore fields. But there is concern in the US that a deep water spill could devastate the coast of Florida. The Chinese-built rig – known as Scarabeo 9 – could be seen from the Cuban capital Havana as it moved slowly west. First to use it will be the Spanish oil company Repsol YPF, which plans to drill an exploratory well around 100km (62 miles) from the Florida Keys. Other foreign companies are also planning to hire the rig. Cuba already produces some oil from small onshore and coastal deposits, but depends for most of its fuel on subsidised imports from its ally, Venezuela. If confirmed, the estimated offshore deposits could turn Cuba into an oil exporter and transform its troubled socialist economy. But the project has caused anxiety in the US, particularly following the 2010 leak at BP's Deepwater Horizon rig, which dumped millions of barrels of oil into the Gulf of Mexico. The Scarabeo-9 will be drilling in even deeper waters, and sea currents mean that any spill would threaten the Florida coast. (CNS): While members of the Coalition to Keep BT Dump Free await their opportunity to express their concerns to their government representatives, the opposition MLA for the district, Anthony Eden, will be hosting a public meeting Tuesday evening to give residents and others affected by the proposed move an opportunity to offer their opinion and input on the plan. Although the coalition is not a politically affiliated movement, organisers said they welcomed the meeting as an opportunity to add additional names to the list of MLAs already supporting the campaign against moving the George Town landfill as part of government’s proposed investment deal with the Dart Group. Representatives from the coalition said they welcomed another opportunity to present the views of its members to the public. Representatives from North Side and East End as well as the opposition leader will be attending the meeting. Alain Beiner,one of the leaders of the single issue movement, said the meeting reflects the growing opposition among people to the relocation of the GT dump and the pressure on MLAs to speak out and give voice to this opposition. “Dart wants the dump ‘out of its backyard’ and wants to dump it on us, with no concern for the consequences,” he said. The coalition is currently using the freedom of information law to gather information regarding the proposal but so far has not been able to find any reports about the decision to move the dump, the selection of Bodden Town as the new location or the impact it will have on the district. The group is still waiting for the government MLAs in the district to answer the questions it has asked and has raised its concerns about continued lack of consultation with the people of the district. Vincent Frederick said he hopes that people will show up to speak their mind at this latest district meeting as he said government’s failure to consult and lack of openness has intensified fears. “We still don’t know who chose Bodden Town, how or why,” he said. Greg Anderson, who will be one of the speakers at the meeting, pointed out that the residents of Bodden town have not been told if there will be an Environmental Impact Assessment or a public rezoning process for Midland Acres, as required by law. 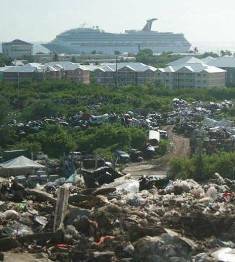 “Government seems completely unconcerned about due process and about the consequences for our people and our environment, and we call on government once again to abandon the planned relocation of the George Town dump. 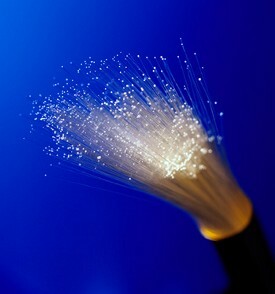 Let’s fix the problem where it is instead of contaminating a new site,” he said. The meeting is set for Tuesday, 24 January at 8:00pm at the Bodden Town Civic Centre.